How do CD business cards work? CD business cards work just like a normal CD and can contain whatever information you wish to put on them up to the capacity limit of the disc (typically a maximum of about 45-50MB, or about 35 floppy discs). The CDs will work in just about any standard PC, MAC or laptop CD/DVD drive.  In a standard drive the disc fits into an inner circular tray as the CD business cards themselves have a raised circular section on their underside which fits neatly into this depression. In a laptop drive with a prominent spindle that you push the discs directly onto, these discs work in exactly the same way as standard CDs. The orientation of the discs does not matter. They sit with the label facing upwards, just as with standard 12cm circular CDs. However these discs are not suitable for use in slot-loading CD drives, although these are fairly uncommon and will not normally be a problem.